Don’t try this at home. In the town of Niagara Falls, you are heading along a street. You suddenly overfly a car, then a bicycle travelling along a path near the water. In an instant you are over the lip of Niagara Falls. In a scary moment you find yourself looming over the precipice and then zooming away across the face of the thundering water. Hard at work giving you this immediate experience is a video camera aboard a flying unmanned aerial vehicle (UAV), made 14,000 km away in the quiet environs of Raglan in the Waikato. The film for Niagara Falls Tourism was shot by SkyMotion Video, Canadian specialists in low-altitude aerial photography and video, using the unmanned aircraft made in New Zealand. Thousands of these remotely controlled small flight craft carrying cameras and video are operating around the world, according to Aeronavics (formerly Droidworx), a 15-person operation that works out of a small warehouse, a couple of sheds—one with a CNC machine— and a double-garage attached to a farmhouse. 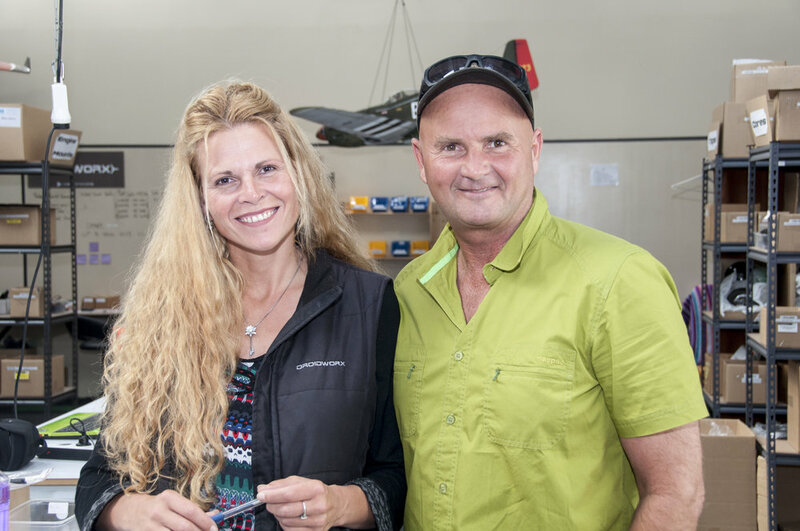 But from this base directors Linda Bulk and Rob Brouwer have built a tech-savvy business that combines equal helpings of entrepreneurial vision and technical ingenuity. Self-described as a manufacturer of advanced multi-rotor airframes, RTF (ready to fly) craft and related accessories, and a finalist in the 2013 New Zealand Innovators Awards with a reconnaissance aerial robot, the Aeronavics team creates, assembles, packs and dispatches kits or fully assembled versions of the four-, six and eight-engined multirotor aerial robots or copters to the world from their rural Waikato base. They number among clients who bought their machines Channel 9 in Australia, National Geographic, Disney, Master Chef, Red Bull, DreamWorks animation, Ericsson and the BBC. They are at the internationally high-tech end of the spectrum: A typical model would include brushless motors with high torque (e.g. Tiger Motor for heavier lifting, 42 x 42 mm, 194 grams, 400 RPM/v – up to 6500 RPM on 15-17 inch prop, powered from a six cell lithium polymer battery). The airframes are made of industrial grade carbon fibre and polymers and include titanium engine mounts and fasteners for the quick foldaway engine supporting booms (up to 540 mm long), and vibration dampeners to isolate the quick-release camera mount on gimbals. The carbon propellers can be up to 15 inches (381 mm) long but can be up to 29 inches (736 mm) long. A typical 2-6 cell electronic stability controller (ESC) can have a smooth continuous 40 amp output or 60 amp output burst for up to 10 seconds. With the capacity to take small point-and-shoot or tiny GoPro cameras (biggest dimension 60 mm), thermal imaging equipment or digital RED cinema cameras up to five kilograms in weight, these machines are being used for multiple applications from movie making to structure inspections. She says they started because they wanted to do aerial photographs using a camera in an unmanned flying craft. They made one craft for themselves and one for a friend who did some aerial photography and posted the photos on the Internet. “Then we started to get requests to make other people these airframes. We imported the motors and designed the electronics and all the components. We got so many requests we realised there was a market and decided to turn it into an engineering business but it had to be scalable. They made an airframe, creating the landing gear, booms, protective cover. “In those days, people were putting a couple of sticks together, wires everywhere— it didn’t look good. We reasoned if people wanted to use an automatically controlled flying craft as a professional tool it had to be strong, lightweight, vibration-absorbing and look good, like a professional tool. So we cleaned it up and made a beautiful construction. It’s like a new car model; you can make it look really good. I redrafted everything and we sent it off to a manufacturer. It’s a special moment when you have a created an idea, you turn it over to be made and suddenly there it is, out of the machine. We had the craft made in Australia but the manufacture was a bit rough around the edges and not the really high-precision engineering we needed. Once they began with idea of a professional craft, they thought they might sell “one or two a week for aerial photography.” But in the first week, there were many requests including one from France asking to be a distributor. The enquiries poured in and after three months they had 60 to 70 distributors worldwide. This was late in 2010. In 2011 they moved to New Zealand. “In March that year, we had to retreat from direct sales because we could not keep up, there was so much demand and in those days we made to order. We had also put all our savings into the business (I am originally from Holland and was allowed to have an overdraft there and we were minus 1000 Euros). We had to wait for people to pay up front for an order so we could use the money to make the craft. “Moving to New Zealand was a lifestyle choice,” says Linda. “Rob, who is Australian with Dutch parents, had been looking at New Zealand for about 20 years. I had been in New Zealand and we started working at a company in Wellington. But we were not keen on that as we are very much country people. Rob had lived in Byron Bay for 10 years. We wanted to try the South Island so moved to Picton and upgraded from working on a table to working in a room with the laptop on a chair.” Moves followed to Queenstown, Richmond (all seven staff living in one big house like a family) and Raglan. While Droidworx, now Aeronavics, claimed to be the first in introducing large multi-rotor remote-control copter technology on a bigger platform, there were other companies doing smaller, cheaper entry-level platforms, more lightweight and in the area of inspection rather than camera platforms. An ally in America became a competitor after watching what they were doing, an unsettling experience. There were expensive German machines being made (around $50,000 to $60,000) and Hong Kong manufacturers were working on things like radio-controlled helicopters. “If photography needed to carry heavier cameras, we were the first to introduce that concept when we said we should develop airframes for multirotors. A lot of people began to fit their own motors and flight electronics into that,” says Linda. Many times people said they had looked at our solution after trying single-bladed remote-controlled helicopters which are hard to pilot and to stabilise. “Fifteen months into our development came the new RED digital camera cinema series and everyone wanted to carry that more on platforms and use them for feature fi lm-making. Up to then our craft could carry about two kilograms but even with the 5D7D cameras they were struggling and working hard to get five minutes’ flight. Their perfectionism had to kick in when customers complained that the new heavy-lift engines sent out without full testing were too strong for the readymade lightweight airframes. “We redesigned the airframes and replaced them for everyone who had bought them earlier,” says Linda. Work is now under way on a spray unit for farmers. “This is a proof-of-concept we’ll have to trial. These are bigger engines because they will be carrying a tank. Lately we have changed that thinking to using a bladder or bladder sides to make sure all the liquid actually is made available. Our aim for the project is to fly 20 kg for 20 minutes but we are not quite there yet. Our first aim is five litres, the second is ten litres and the third go will be the 20 litres. A flying demonstration controlled by engineer Coenraad demonstrates easily why the electronic stability control is so good. “The computer combines inputs from level meters, accelerometers, a gyroscope, digital compass, barometric pressure and GPS and the combination of all these sensors provides stabilisation. The only output is the speed of the motors,” he says. Coenraad talks of the many fail-safe aspects: if the battery gets too low or if battery and transmitter fail the craft can be programmed to return and land by itself. If the controls fail, the craft can return to home and land or slowly land itself on the spot. In emergency mode it will climb to a preset height and then return to home and land, useful if you want to clear high obstacles. Its versatility extends to mustering sheep, checking current leakage on high-tension power lines, thermal imaging hot spots in bush fi res where humans cannot penetrate the smoke and potentially being able to drop a fishing line out beyond the surf at a favourite spot. As a search and rescue eye, an aerial robot could scan strip of coastline in 20 minutes when it could 26 take a search party on foot all day. Improvements in the technology since he began include a shift from 72 MHz FM radio receiver crystals—open to interference from a fellow radio-control flier’s equipment—to the 2.4 GHz spread spectrum 8-channel control, dedicated and interference-free. Motors running high voltages with less current have lowered energy loss and improved efficiency to where one kilogram lifts for 5 amps are possible while once 10 or 20 amps was the norm. The real value he sees them adding is in the quality of their rigorous testing and acceptance process, machines being pushed to the limits to be made as safe as possible, even as they are customised for specific customer’s needs. Linda Bulk sees a broader side of the industry. As a company awarded a grant by Callaghan Innovation to develop aerial robotics as an innovative industrial solution, and as a participant in the Callaghan-organised UAV forum, Aeronavics understands the importance of using what has already been developed and adding a vision both as an individual innovator but also as a collaborator in a fast-growing industry. “It has always been in our hearts to go the Open Source way,” she says. “We are starting to get into areas where you have to be a little bit sensible as well, because you’ve got to be commercial and competitive, and ultimately you just want to grow the industry. “There is just so much potential in it and you have to trust a little bit in life that what goes around comes around. It is not always through ways that are the most obvious. “We’ve been double-crossed a couple of times and disappointed, which has been a learning curve in that you’ve just got to be a little more careful in some areas. But ultimately we want this technology to find a place for the end user, because it has so much to offer—increasing efficiency and increasing safety while it can just capture amazing and creative visual shots. “Its potential is fantastic but ultimately it is to help people. A lot of companies are now doing their part in a sort of Cloud and you’ve got to be a little bit selfless in that. “Wanting to keep things that you can see can make a difference at large is a challenge to humanity to become more sharing and more collaborative. “Sometimes I can see, too, how the drive to be better than another can create amazing solutions. But it’s almost like it is out of balance because the collaborative seems to been forgotten about.”.